High Wycombe, October 16th, 2013 – Digital Image Correlation (DIC) is a new combination of hardware and software available from Instron, designed to optically detect strain and displacement within a defined area on the surface of specimens or components exposed to loads, and visualize these in real-time on a computer screen, so that they can be traced over the entire duration of the test. Image and calibration data is supplied by an Instron® Advanced Video Extensometer (AVE). The associated DIC software provides visualization and also saves the data at an adjustable rate of up to 50 Hz in the form of individual images for subsequent analysis in post-processing mode. The software runs independently of other programs, and leverages the graphical layout and tabbed style of Instron’s Bluehill® materials testing software – making the user interface familiar and easy to use. 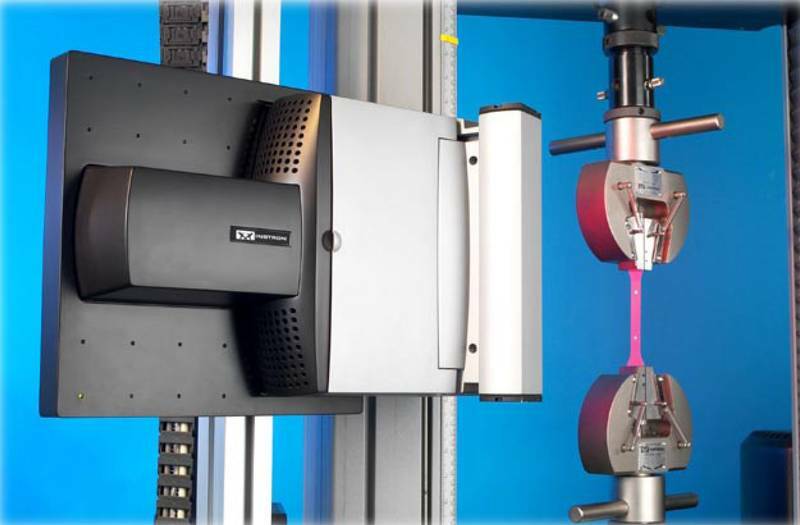 The DIC technology provides numerous benefits compared to traditional strain measurement, including, for example, the documentation of phenomena such as discontinuous strain, localized necking, and more. DIC enables the detection of strains and displacements in cases where conventional extensometers are impractical, and enables the visualization of the side profile of flat bending or compression specimens. The system also reveals cracks which are not visible to the naked eye. Finally, the DIC technology helps with standard compliance, as it identifies local strain that falls outside the standard gauge length of conventional extensometers. The DIC software comes with a large number of standard functions. These include the generation of surface maps containing information on local axial and transverse strains and displacements, shear strain, and maximum and minimum normal strain. Further standard features include saving of processing parameters, graphical processing and the capability of synchronization with Bluehill® test data such as load, crosshead position etc. offered by Instron® is a high-resolution optical extensometer for use in materials and components testing. The device allows high-precision strain measurement in the loading direction and (optionally) transverse to the loading direction, without contacting the specimen and without adverse influence on the measurement. Whilst providing a performance at least equivalent to that of conventional contacting strain measurement devices, the AVE clearly offers superior bene¬fits when it comes to fragile specimens such as thin metal or plastic foil, textiles or paper, fine wires or soft biological tissues. Unlike spring-loaded clip-on extensometers, there are no knife-edges in contact with the specimen, which may cause stress concentrations and hence premature failure of the specimen. The device enables highly accurate measurement even on specimens with smooth surfaces, where the use of mechanical clip-on extensometers involves the risk of knife-edge slip. 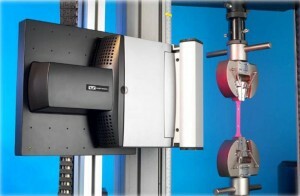 The AVE’s measuring system contains no moving parts, so there are no errors due to inertia. The AVE is therefore never at risk for wear, and a constant, high accuracy of 0.5 % of the reading is ensured at all times. In addition, there is no possibility of damage to the AVE due to energy released at specimen failure. Instron (www.instron.com) is a globally leading manufacturer of test equipment for the material and structural testing markets. A global company providing single-source convenience, Instron manufactures and services products used to test the mechanical properties and performance of various materials, components and structures in a wide array of environments. Instron systems evaluate materials ranging from the most fragile filament to advanced high-strength alloys. 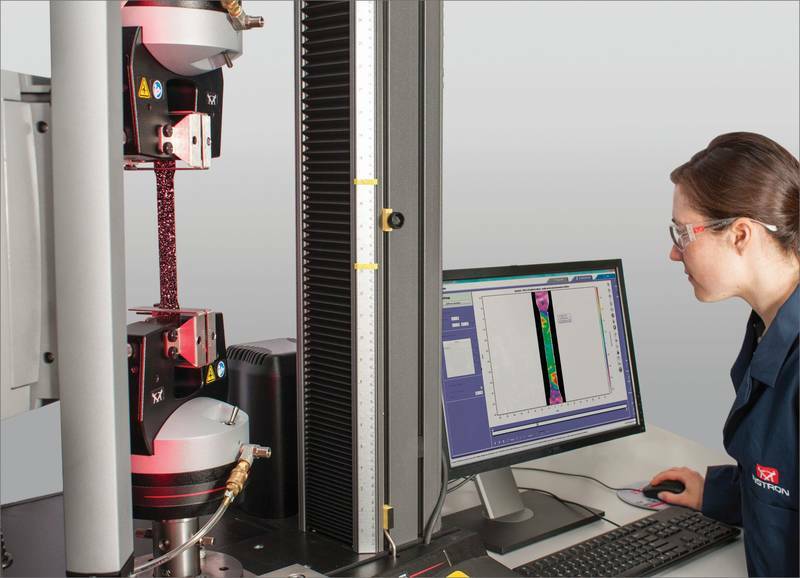 With the combined experience of CEAST in designing plastic testing systems, Instron enhances materials testing offerings, providing customers with comprehensive solutions for all their research, quality and service-life testing requirements. Additionally, Instron offers a broad range of service capabilities, including assistance with laboratory management, calibration expertise and customer training. Instron is part of the Test and Measurement division of the US based Illinois Tool Works (ITW) group of companies with more than 850 distributed business units in 52 countries worldwide and a staff of approx. 60,000.